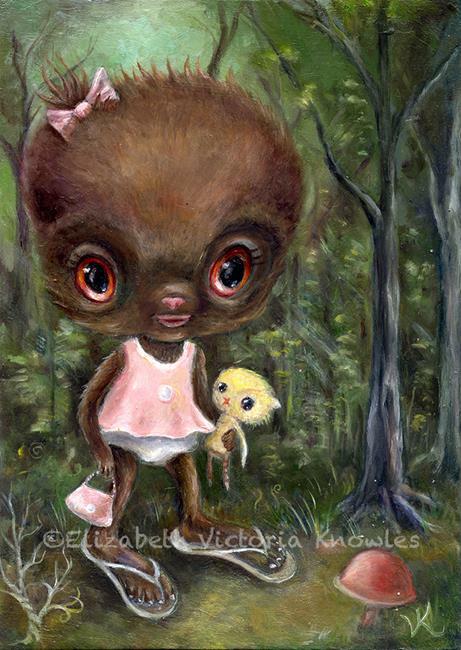 I met Baby Sasquie the other day whilst taking a little stroll through the forest. I was startled at first, because I'd always heard that Sasquatches don't exist, and that they might be dangerous. But Baby Sasquie just wanted a friend, she was LONELY, can you imagine?? Poor Baby Sasquie. Poor Bigfeet in general. I am entering this piece in the "Woodland Creatures" exhibit, because what better Woodland Creature is there than the one in which nobody believes?